Last July was certainly one of the strangest times I can remember as a baseball fan. Leading up to the deadline, it was a foregone conclusion that the Cardinals would be active in trying to trade for that one pitcher to put them over the top. But to be honest, no one who roots for St. Louis could have called the deal that ultimately may have changed the next decade under the Arch. 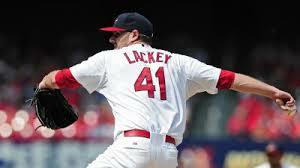 Lackey was brought in with plenty of unknowns because it was the one thing no one doubted that the Cards needed most. Big game experience is hard to get and even harder to acquire, but the St. Louis front office was able to do both and clear up a logjam in the outfield at the same time. Fast-forward a short few months and tragedy required another move be made, but that was all possible because of the fine print in a certain contract. Professional athletes are not hurting in the wallet, and certainly Lackey is no exception. Because he missed a season due to injury, however, the Birds on the Bat are only required to pay the two-time World Champion starter a salary of 500k. It may be difficult to put that into perspective when records show total earnings of over 108 million so try this on for size. Out of every St. Louis pitcher last year who saw time in the majors, only Keith Butler earned the same as what Lackey will bring home in his free agent season. So safe to say, this is a big campaign for both parties, especially since it sounds like any future contract talks have been shelved for the time being. The ability to get a proven starter for cents on the dollar did open up the ability to make other moves, something the Cardinals have already done and haven’t been shy in noting interest in making further deals. One non-move that was predicted, however, involved the All-Star pitcher from last season who wore #41. Pat Neshek quickly established himself as a fan favorite early in his St. Louis tenure, but it was always destined to be a short stay and even more so if you consider Lackey paid handsomely to get the sidearm specialist to swap jerseys. Neshek should appear later in our countdown as well, but he isn’t the only one to make multiple appearances on this list. Molina will eventually retire with a four on a Cardinal uniform, but every time I catch a glimpse of him in a #41 it still just doesn’t seem right! Luckily for the spoiled faithful, it doesn’t sound like the catcher has any plans of taking off his pads anytime soon.